Presentations from the 2019 CSAM – The Safety Conference are now available for download below. For example: Safety Course – "ROOM5W"
PLEASE NOTE: If the course is not visible in the downloads section that means the course is unavailable for download. 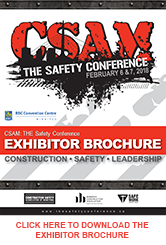 Thank you for attending the 2019 CSAM – The Safety Conference. Also thank you to all our Sponsors for another amazing year.